Brazilian water utility Companhia de Saneamento Basico do Estado de Sao Paulo -- Sabesp, for short -- is starting to hit its stride again now that weather and forex headwinds have eased. After struggling for several quarters with drought conditions in the Sao Paolo region and a rapid decline in the value of the Brazilian real, water utility Companhia de Saneamento Basico do Estado de Sao Paulo (NYSE:SBS) -- Sabesp, for short -- posted strong improvements across the board that led to it posting positive net income for the second quarter in a row, a result that suggests operations have finally started to normalize. Let's take a quick look at the company's most recent results. YOY = year over year. Results have been converted to U.S. currency at a rate of 1 USD = 3.48 BRL. Data source: Sabesp quarterly earnings release. The third quarter of last year was one of the toughest periods in the company's history. The combination of drought conditions at its major reservoirs forced the company to offer rebates to customers who conserved water. In addition, the Brazilian real was rapidly losing value to the U.S. dollar as oil and other commodity prices declined, and natural-resource-rich nations such as Brazil saw huge losses to the strength of the dollar. 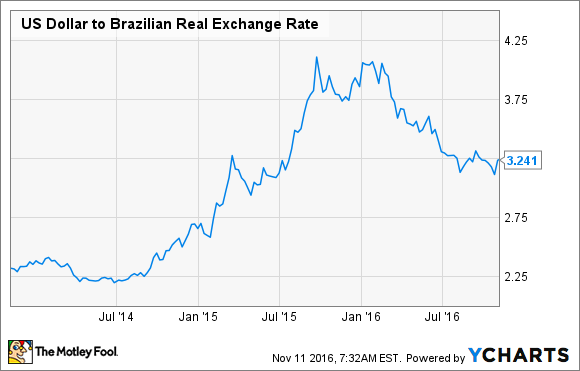 U.S. dollar to Brazilian real exchange rate data by YCharts. Now, many of these issues have resolved. Reservoirs' water levels are back to within their normal ranges, so Sabesp has been able to eliminate those water savings rebates. That, coupled with an 8.4% tariff increase in May of 2016, led to the 17% gain in revenue for the quarter. Operational expenses increased as well, but the gains in revenue far outpaced those in costs. On the financial side as well, the strengthening of the real meant spared the company from further heavy losses related to its debt payments. Just under half of Sabesp's total debt outstanding is denominated in either U.S. dollars or Japanese yen, so currency fluctuations can have a huge impact on its interest expenses, ultimately sinking net profits. What happened with Sabesp this quarter? Total volumes of billed water and sewage increased 4.5% and 4.9%, respectively. Today, Sabesp now has water and sewer connections to 100% and 78%, respectively, of customers in the in the Sao Paolo municipality. The company's stated goal is to maintain 100% water coverage and to increase sewer connections and treatment to 95% by 2020. Water inflows to Sabesp reservoirs are up 27% compared to this time last year, while outflows are only up 10%. Better operational results and a more favorable currency environment have improved the company's financial standing significantly. At the end of the quarter, net debt to adjusted EBITDA stood at 2.45 times, the ratio's lowest level since 2013. Net income for the first nine months of 2016 is already 273% higher than all of 2015. Since Sabesp's dividend is based on a 27.9% net income payout ratio, investors can likely expect a much stronger dividend this year. Sabesp continues to make steady progress toward its goal of increasing connections across the Sao Paolo municipality, and the company is still spending a lot of money to get it done. Between now and 2020, Sabesp expects to invest $3.6 billion on improving water and sewer connections. It will always have to spend capital to add connections as the population grows, but once it reaches its desired 95% connection rate, it should be able to significantly cut those annual outlays. These past two quarters have shown that Sabesp can be a profitable water utility when it isn't dealing with rapidly deflating currency and epic drought conditions. It is still very vulnerable to currency fluctuations, but that should ease over the next three to four years, as many of the company's foreign-denominated debts will come due and be paid off. All of these things suggest that Sabesp's outlook is much brighter than it has appeared in the past several years. Sabesp Stock Upgraded: A Cheap Utility in Brazil?